Scientific name: Ziziphus spina-christi (L.) Desf. Synonym name: Rhamnus spina-christi L.
Ziziphus, the ancient Greeks called the tree zizyphon, from the Arabic zizouf, a name for the mythical lotus. This was taken into Latin as zizyphum, or zizypha for the fruits. spina-christi, spina, thorn; prickle, spine; meaning "covered with Christ's-thorn." 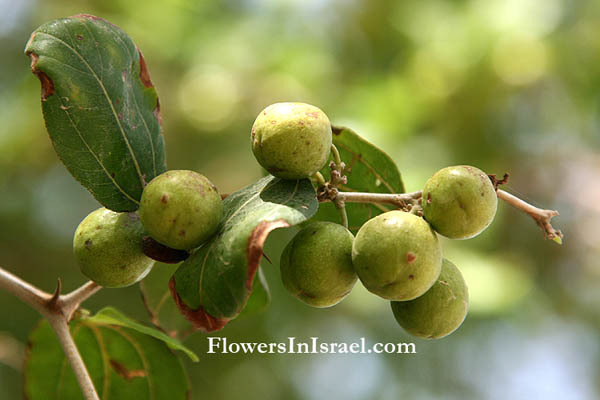 Many scholars identify the jujube as the biblical atad, mentioned in the "Parable of the trees" in the book of Judges (Judges 9:15) known as Jotham's Parable (Hebrew: משל יותם), an allegorical story against the monarchy in recent years told on Tu B'shvat as a children's tale. Jotham, the youngest son of Gideon and the only one left living besides Abimelech, escapes to Mount Gerizim, near Shechem and tells what has come to be known as Jotham's Parable (Judges 9: 7-21), the story of "the trees who went forth to anoint a king over them." The fig also refused, saying, "Shall I leave my sweetness and my good fruit to wave over the trees?" Likewise the vine: "Shall I leave my new wine which cheers God and men to wave over you?" Finally all the trees said to the Jujube (Ziziphus spina-christi, Hebrew: Atad, אטד), 'Come and be our king' and the Jujube, with nothing to offer but its shadow, agrees to reign, but not without making a thinly-veiled threat: 'If you really want to anoint me king over you, come and take refuge in my shade; but if not, then let fire come out of the Jujube (Atad) and consume the cedars of Lebanon!' Judg. 9:15). The olive, fig, vine and jujube in the parable stand for different kinds of people. The good fruits are symbols of good works. The jujube is the type of someone who does not do good uses or only does them for show and for selfish gain. The olive, fig and vine are modest and wish only to serve, but selfishness loves to rule and to be served. Fire coming out of the jujube means the burning of selfish desires. The cedar which the fire destroys stands for rational understanding. Someone who is proud or angry cannot be wise. Yotam, the teller of the parable, is using the metaphor of the atad to ridicule his older brother, Abimelech, who has unjustly annointed himself king, surrounded himself with yesmen and murdered all his brothers save for Yotam. 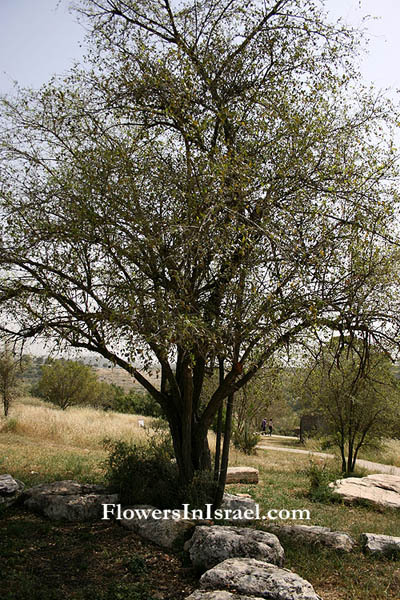 The jujube tree is common in Samaria. It can grow very large, easily providing shade for these small trees. 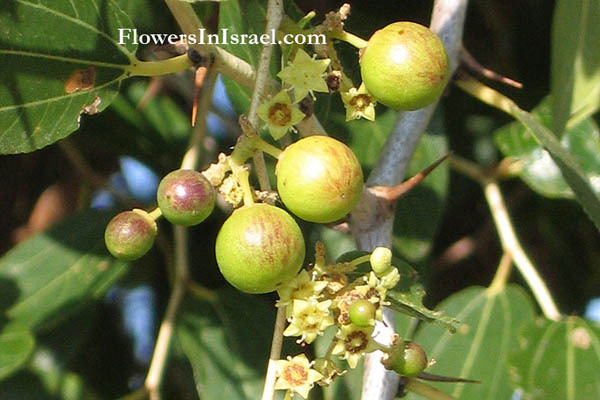 The wild jujube growing in Israel is apparently of Sudanian origin. It is a broad-crowned, spiny tree with intertwined branches that reach nearly to ground level. Its leaves are smooth and ovate. The yellowish fruits are round in shape. They are edible, not unusual tasty and it is very much the poor relative of the olive, fig and vine, mentioned in the parable. In the past jujube fruits were commonly sold in the marketplace. In the Arava Valley, the tree is usually evergreen, but in the north it is deciduous and loses its leaves in the cold winter. The jujube grows in wet desert habitats and in riverbeds with deep soil that can store water throughout the summer. In the region between Hatzeva and Jericho, jujube is the second most common tree, after the acacia. Its wide spreading root-system is well-known for leaching all nourishments from the soil. A farmer who wants his orchard to succeed must first uproot every jujube in the area, small saplings as well as full-grown trees. "They dressed Him up in purple, and after twisting a crown of thorns, they put it on Him" (Mark 15:17). "Christ's Crown of Thorns", Euphorbia Millii Des Moul., familiar to Europe and U.S.A. in the present day, has nothing to do with the Biblical crown of thorns. It is a native of Madagascar and was completely unknown in Jesus' day. The Quran mentioned Ziziphus spina-christi twice (LIII: 13-18; LVI: 28-32); the lote-tree is commonly identified as Ziziphus spina-christi and accordingly this species is highly respected by the Muslims through the Middle East. This is the only tree species considered "holy" by Muslims and has a special role as a cemetery tree due to its being mentioned in the Quran. …I will tear your flesh with desert thorns and briers. on all the thorn bushes and on all the watering places. You will know them by their fruits. Grapes are not gathered from thorn bushes nor figs from thistles, are they?